I had taken a series of color classes with Gerald Roy, another very important teacher for me, and I was fascinated with the interactions of the colors in a triad, three colors equidistant from each other on the color wheel. For Sandi’s Log Cabin with a Twist class, I tried to use this color palette in a very non-traditional way, and I love the result. 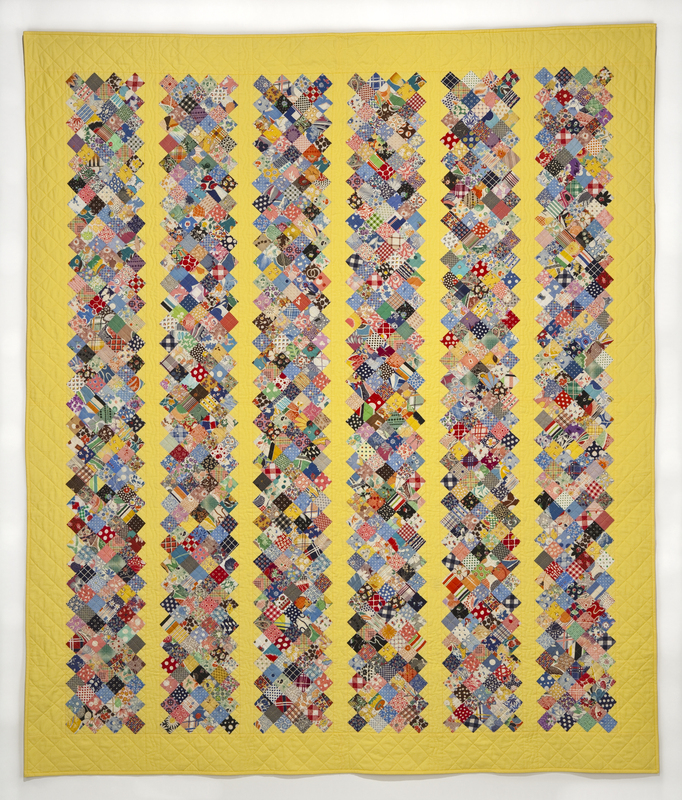 Also, this quilt marks the beginning of my desire to get as much print, color, and pattern into each and every quilt. If the fabrics fit into my very broad definitions of the “turquoise”, “magenta”, and “yellow-orange”, I wanted to get them into this quilt. The quilting provided me with another important learning opportunity, long after the class was finished. Since I had made such a non-traditional quilt, the quilting would need to match the quilt. 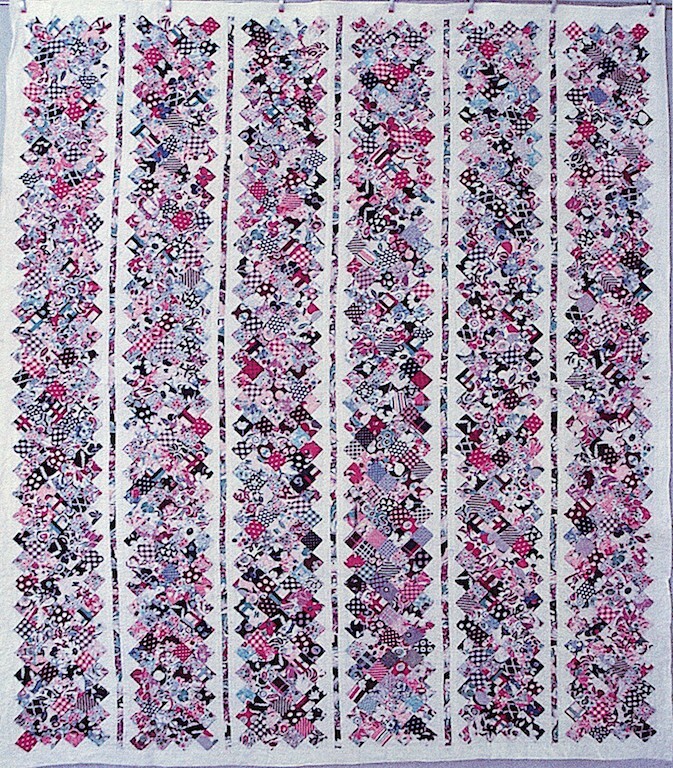 I added this free-motion quilting, using 30-wt. rayon Sulky in two different colors. This took forever, but was tons of fun. I tend to downplay some of the quilts I have made merely because they were made using someone else’s pattern and/or directions. So here I just want to celebrate that this is a great quilt. 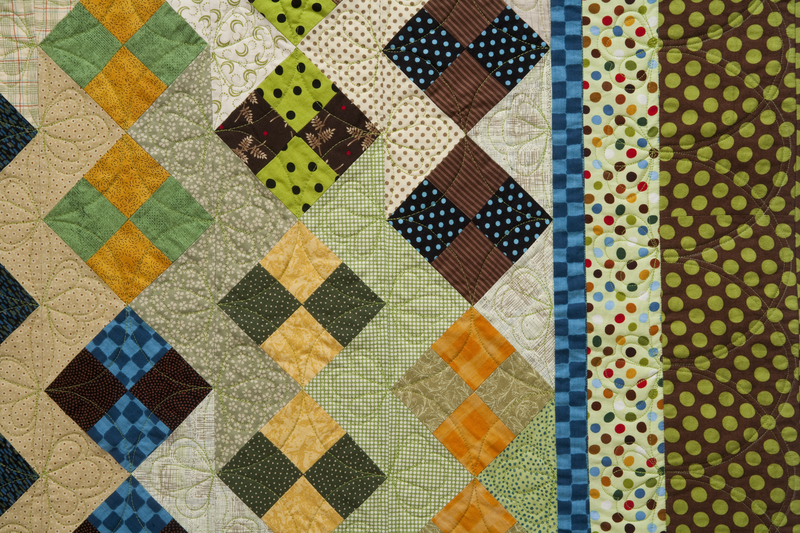 I sat in a class and listened to another quilter share her journey with a quilt. By mimicking her work with my fabrics, personal history, and insight, I learned so much. It’s not the product but the process. Found another photo of the Rows of Seven pattern. Interesting. And I still like mine better. Old Business: I keep forgetting to add this, so here it is. For anyone still guessing which fabric is non-vintage in the Dresden Plate detail photo in this previous post, the correct answer is the multi-colored pansy fabric just below the blue plaid at 3 o’clock on the plate. Somehow I connect this fabric with Debbie M., whom I helped make a Double Wedding Ring quilt top, but I could be wrong. Ahhhh, memories built right into the fabric. Slightly Newer Business: And now on to more of my works using the vintage stuff. 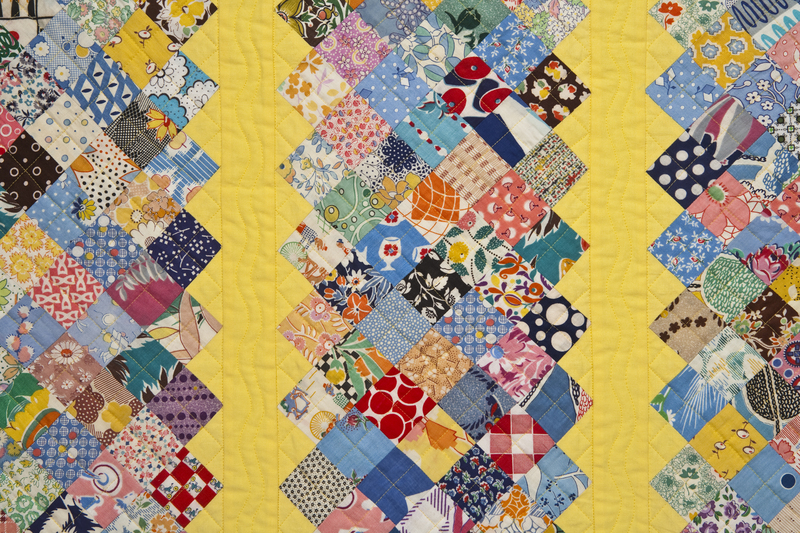 To continue the history, once I had cut into the pieces in my vintage fabric collection for the Dresden Plate quilt, the floodgates were open. I sought more ways to use these fabrics, while learning more about piecing and quilting. 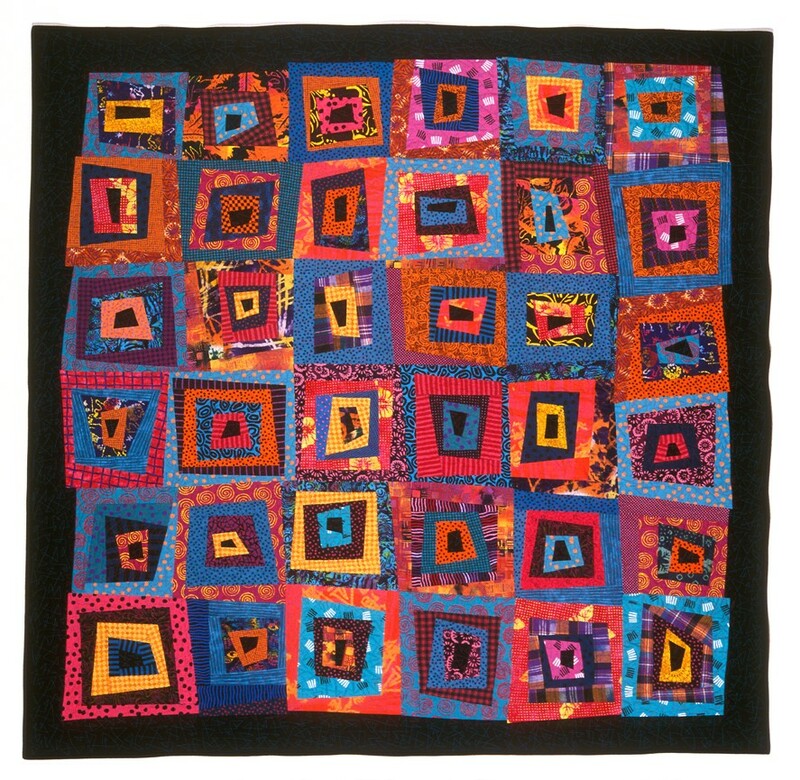 What better way to self-teach than to find quilts that you love, and to make them for yourself. 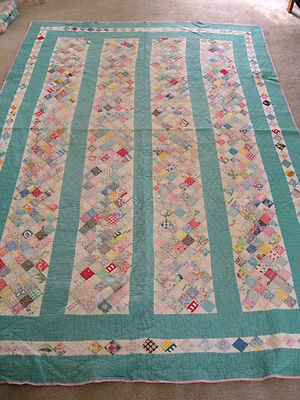 Having taken a wonderful foundation-piecing class from Jane Hall and Dixie Haywood, I knew this would be a relatively simple quilt, using up many small scraps as well as strips cut from larger yardage. The square blocks are made by sewing right angle triangles on either long side of a wedge that has been covered with fabrics using the flip and sew method. Putting all the blocks together, with a solid inner border the same size as the original blocks, was quite simple. The quilting was the hard part for me. 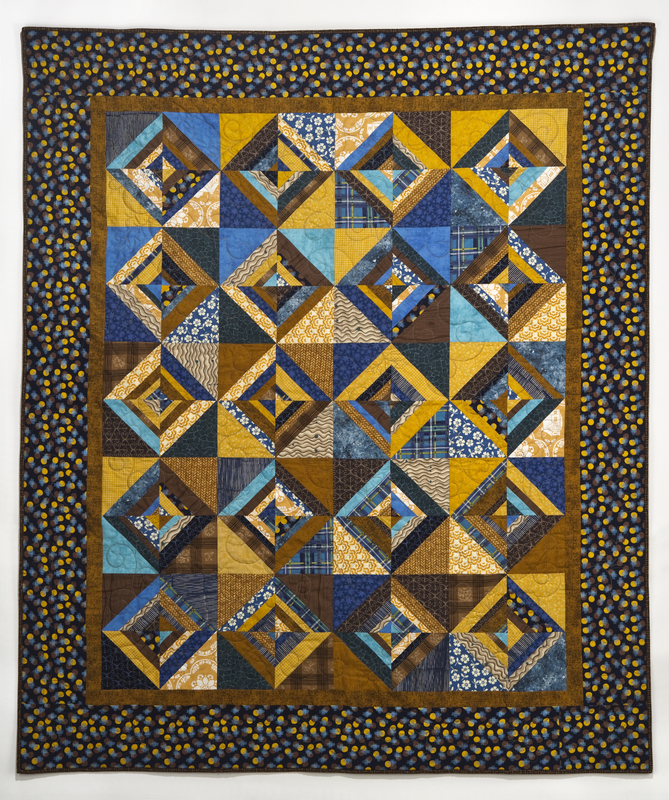 Since I had never done free-motion quilting before and knew this pattern was right for this quilt, I had to create a “just do it” moment at an Empty Spools retreat at Asilomar, and then the work was done. So much fun. I wish the quilting showed better in the photo, especially so you could see my new favorite meander shape—the Mickey Mouse hand with four chubby fingers—scattered liberally in this quilting. Also, any scrap that was at least 2.5″ wide ended up as part of the binding. Usually I don’t think this works for a border, but it certainly works here. 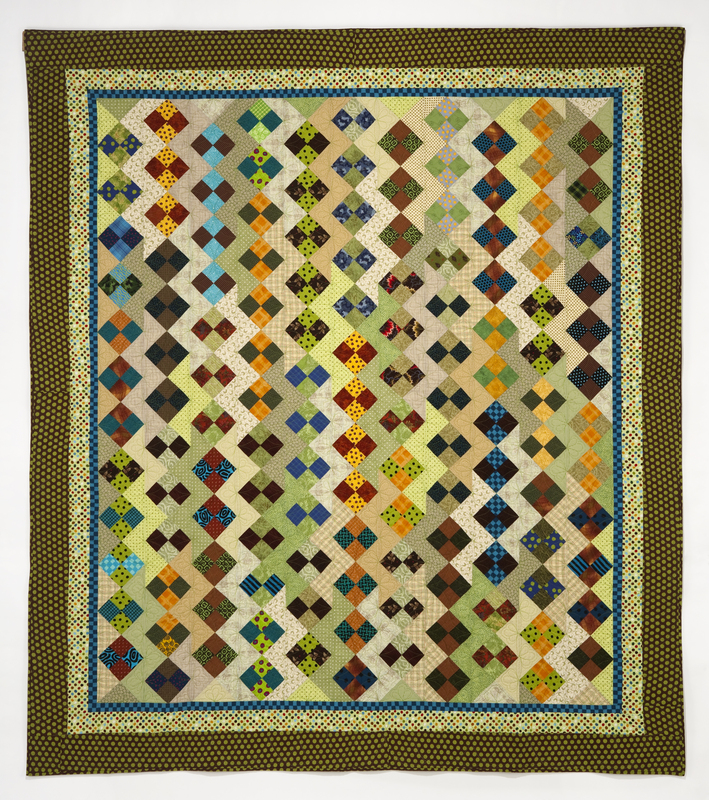 At Sibila’s suggestion, we shot this on a black background, and I think this choice makes a big difference in how vibrant the quilt looks. 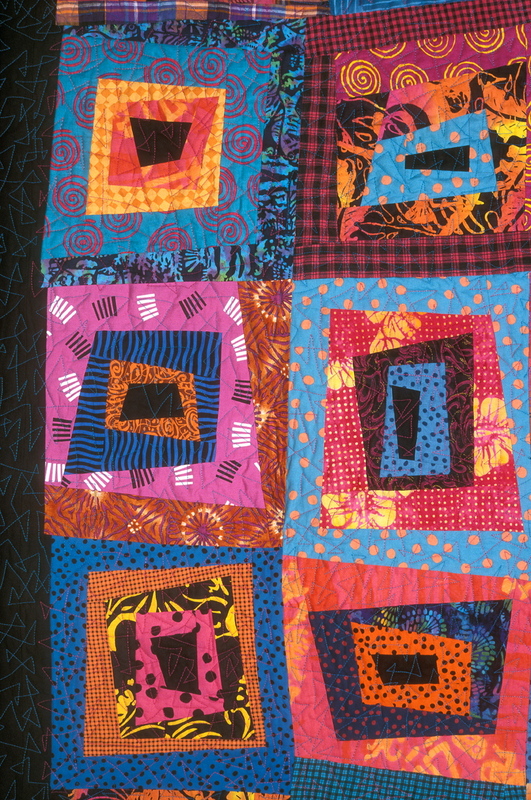 This quilt is featured in Mary Mashuta’s book Cotton Candy Quilts.